Time for another reading roundup! 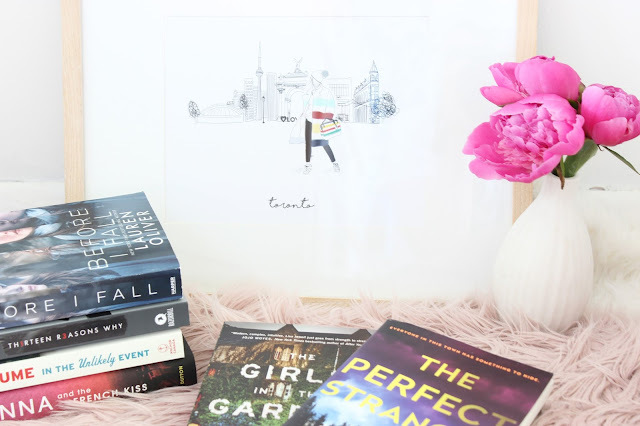 I didn't even realize that I read six books in just over a month, but I was pleasantly surprised when I went to do this post. There were some hits, some misses, and some forgettable books. Keep reading to hear my (apparently very lengthy) thoughts and recommendations! The story centers around Samantha Kingston who dies in a car accident at the beginning of the story, but keeps reliving the same day over and over (very Groundhog Day, style). She goes through different stages of acceptance and denial while realizing her actions can affect the outcome of each day. It focuses on the relationships we have, what we value most in life, and how small, seemingly inconsequential actions can have tremendous results. I was pleasantly surprised with this book! I very rarely read YA, but happened to win this book in a contest from Harper Collins on Facebook! I read it in about a day, and found myself anxious to see what happened next. Like I said, it's super quick to get through, and it really makes you question your own decisions. Clay Jensen discovers a package of cassette tapes on his front porch, only weeks after a girl at his school committed suicide. As he listens to the tapes, and starts uncovering the reason for them, he begins seeing people around him in a new light, while questioning his own involvement in Hannah's death. As he ventures through his town following Hannah's instructions, he discovers how people’s actions, however small they may appear, can accumulate into something unbearable. I've heard so much hype surrounding the Netflix series, so I thought I would pick up the book (because I'm that kind of person). Similar to Before I Fall, it was a super quick read, but I didn't feel nearly as satisfied at the end. It was one of the few books where I really felt that it needed more. It was far too short, and you didn't get the character development that I think was needed to really explain all of the circumstance. But at the same time, the abruptness of the novel could have been intentional from the author. Since it centers around a girl who committed suicide, but is told from Clay's perspective, we really would not know the full reasons behind her choices; we would only get what she provided. I think if you liked the Netflix series, the book would be a great accompaniment You can get through it in a day or two. While I didn't feel like I could relate to many of the characters in this book, I do still think it is a good read, and addresses mental illness in a thought-provoking way. Set in Elizabeth, New Jersey this book details the true events of three planes that crashed in a span of 52 days in the 1950's. It follows three generations of families and the impact the crashes had on their lives. I really, really struggled getting through this book. I've never read a Judy Blume book before, and I don't think I'll be picking up another one anytime soon. I think it was a combination of her writing style and the storyline, but nothing appealed to me. I didn't relate to any of the characters, and actually found myself getting angry a lot of the time. While I understand the storyline was meant to be upsetting, I didn't find myself liking enough of the characters to get upset at each subsequent plane crash. Overall, unless you are a fan of historical fiction or Judy Blume, I would give this story a hard pass. Sent to a boarding school in Paris, France in her senior year of high school, Anna must find a way to establish herself in a strange land. As she learns the language and culture, she also finds herself falling for a classmate, who is perfect and caring at times, but evasive at others. Anna needs to find a balance between her previous life and the one she has established in Paris. Vlogger Read by Zoe has raved about this book so many times, I finally found a copy online and was so excited to read it, but I was really disappointed in this book. It could have been because it was overhyped, or because I'm not a fan of YA books, but I found myself hating the main character. I have a problem with books that have the protagonist fall head over heels for someone and completely loose themselves in the process, who disregard their friends and family, and who let other aspects of their lives suffer so they can pursue a love affair. Call me a pessimist, but I like strong, independent heroines. If you're in the mood for a sappy, young chick-lit novel, then this would be the book for you. But if you're not interested in reading about rich kids living abroad and the problems they face, then I'd skip this book. After a disturbing event, 13-year-old twins Grace and Pip move to a picturesque area in London with their mother. As the family tries to move on, they discover that the communal garden their home backs onto is full of strange characters and secrets. While the girls get wrapped up with local home-schooled kids, the family must also decide how much they are willing to reveal from their past. When tragedy strikes again, everyone becomes a suspect. This book was slow, but I enjoyed a lot of aspects of it. I'm not going to lie--I was mostly interested in this book because of the beautiful cover. With a lot of thrillers, I find that there are fundamental flaws when it comes to suspects. The beginning of this novel focuses on one character as being the likely suspect, but once the disturbing events unfolded, the focus was completely shifted, and said character was not mentioned once in regard to his possible relation to the crime (super vague but I don't want to give it away). The characters were very unique in the novel, and hard to relate to. The girl’s mother was the most relatable in my option, and her actions were understandable, although not necessarily what I would have done. The ending was a bit of a letdown for me, but I still think it was a good book if you are looking to get into thrillers. A career-destroying event causes Leah Stevens to change career paths, and forces her to move from Boston to a newly established small town with her long-lost friend and former roommate, Emmy Grey. While the women had not seen each other in eight years, they quickly fall back into routine. But after Emmy goes missing, Leah must decide if she wants to immerse herself in the investigation and risk having police dig up her own past. She soon realizes that Emmy is not who she thought she was, and as she begins her own investigation, she realizes just how little she knows about the girl she has shared so much of her life with, and how far she is willing to go to expose her secrets. This was by far my favourite book that I read. While it took me a while to get through it (chalk it up to the stress of finding a new job, and summer-time events), I really loved it. It was full of twists and turns, and kept me guessing right until the end. I'm a huge fan of thrillers anyway, and I find a lot of them too predictable, but the series of events unfolded in such a way that challenged and surprised the reader. I'm really looking forward to reading more of her books this summer, and I would highly recommend you pick up this book if you are a fan of thrillers! What have you been reading lately? I'm always up for recommendations!